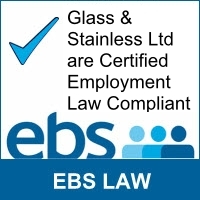 At Glass & Stainless Ltd we have a reputation for delivering excellent quality and our bespoke glass service is no different. Below are some of the types of glass we can supply. Glass & Stainless Ltd offers a nationwide delivery service for its glass. Standard lead-time on toughened glass is 5-7 working days and toughened laminated is 10-14 days. All other glass lead time on order, however an express service is available on all products if required.